You are a member of a user group associated with a contract and warranty share, that includes a contract that enables access. You are a member of a user group associated with a device group, that contains a device that is covered by a contract that enables access. (Single and multiple mode are described in Contracts and warranties. User groups are described in Manage your user groups). The summary also displays your current role in HPE Support Center (for example customer, partner, employee). In the summary, follow the links under Gain access to entitled features and content to link your HPE Passport ID to additional entitlements. 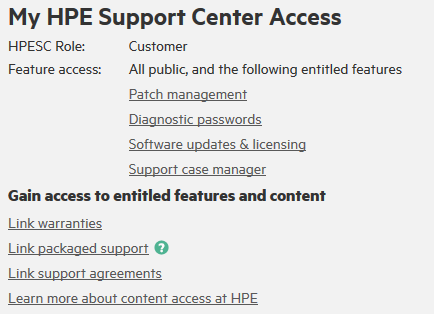 See More Information on Access to HPE Support Materials or click Learn more in the summary for additional information. Sign out of this HPE Support Center session. 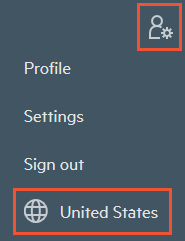 See The language and country selector.